Union Minister of State (I/C) for Tourism, K J Alphons announced that the Ministry of Tourism sanctioned projects worth Rs 85.23 crore for the development of Spiritual Circuit III for Kerala under Swadesh Darshan Scheme. 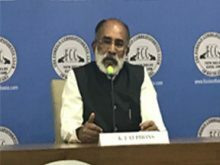 Addressing the media in Thiruvananthapuram, Alphons said that the sites identified under the circuit are spread across all 14 districts of the state and cover 133 religious places. He said the districts where the projects would be implemented are Kasargode, Wayand, Kannur, Kozhikode, Palakkad, Malappuram, Thrissur, Ernakulam, Idukki, Alappuzha, Kottayam, Pathanamhitta, Kollam and Thiruvanathapuram. The Minister said the destinations have been selected keeping in view the inherent historic, cultural and religious significance of the places. The development works include community hall, Annadhana Mandapam, multipurpose hall, toilets, cafeteria, parking facilities, landscaping, pathways, illuminations, signages, dustbins, etc. The circuit covers religious sites all across the state from Ananthapadmanabhaswamy Temple in the northernmost district of Kasargode to the Madre De Deus Church in Thiruvanathapuram, the southernmost district. The circuit will cover several historical religious sites across the state like the Cheraman Jumah Masjid (Kodungallooor), Koodalmanikyam temple (Irinjalakkuda), St Thomas Church (Malayattoor), Thriparayar Sreerama Temple (Thrissur), etc. In reply to a question, Alphons said that the sites have been identified after elaborate study and discussions with all stakeholders. He pointed out that 60 per cent of domestic tourism is related to spiritual circuits.